Nitric oxide (NO) modulates various metabolisms through interaction with thiol proteins and hemoproteins. Although NO interacts reversibly with iron moieties of heme proteins, including cytochrome P450 (P450), dynamic aspects of the formation, catalytic functions and fates of NO-P450 adducts remain to be elucidated. When incubated with NOC7, which spontaneously and stoichiometrically releases NO within 5 min, microsomal P450 rapidly formed nitrosyl-heme adducts as determined by the electron spin resonance method. The signal intensity for the complex increased with time, peaking at 30 min and decreasing to below detectable levels by 60 min of incubation. In contrast, the microsomal levels of low-spin ferric forms of P450 (g = 2.26) rapidly decreased during the initial 30 min but recovered time-dependently thereafter. Analysis by differential spectra (reduced form/CO-reduced form) revealed that on incubation with NOC7, the form of microsomal P450 also changed in a biphasic manner. To elucidate the mechanism for the decrease in the levels of P450, microsomal levels of P450 isozymes (CYPs) were determined by Western blot analysis using specific antibodies against CYP3A2 and CYP2C11, major isoforms found in male rat liver. Kinetic analysis revealed that no appreciable degradation of P450 proteins occurred during the incubation of microsomes with NOC7. The effect of NO on the catalytic activity of the enzymes was determined by using testosterone as substratebecause hydroxylation of steroid hormones is one of the major functions of P450. When exposed to NO, the hydroxylation activity in microsomes rapidly decreased during the initial 10 min and then disappeared slowly. These results suggested that NO formed dissociable complexes with P450 isozymes and the catalytic functions of these isozymes were irreversibly inactivated after dissociation from their heme moiety. P450 plays important roles in the metabolism of physiological substrates and xenobiotics, such as steroids, fatty acids, prostaglandins, environmental pollutants and carcinogens. NO reacts with various molecules, such as superoxide, iron, thiol compounds and various hemoproteins, including P450 (Henry et al., 1993; Nathan, 1992; Kim et al., 1995), at nearly diffusion-limited rates (Cassoly and Gibson, 1975; Doyle et al., 1988). These proteins might be the primary targets for NO. Although NO interacts reversibly with the heme iron of P450, dynamic aspects of the formation of NO-P450 adducts, their fates and catalytic functions remain to be elucidated. 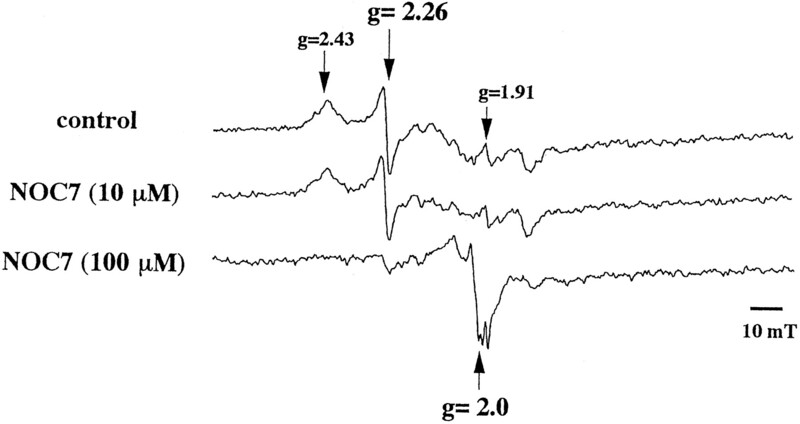 ESR spectra of a ferric form P450 reveal a typical feature in which low-spin signals (g = 2.43, 2.26 and 1.91) are resolved at a temperature of liquid nitrogen. P450 forms ferrous (Fe2+)-CO complexes that exhibit a Soret absorption at 447 nm. The interaction of NO with sulfhydryl compounds has been the focus of attention because of the relatively long lifetime of S-nitrosothiols and their reservoir function to release NO slowly. The catalytic functions of some enzymes, such as plasminogen activator, are enhanced by S-nitrosylation (McCall and Vallance, 1992). S-Nitrosylation of P450 may affect its catalytic functions because P450 contains four to nine free cysteinyl residues. Recent studies in this laboratory revealed that hepatic levels of P450 markedly decreased in endotoxemic rats, particularly when large amounts of NO were generated by inducible NO synthase (Takemura et al., 1996). To clarify the effect of NO on the fates and functions of P450 isozymes, we determined changes in the levels and activities of the isozymes with rat liver microsomes and purified P450 isozyme. NOC7, ONOO− and DMPO were obtained from Dojin Co. (Kumamoto). Testosterone and diamide were purchased from Wako Pure Chemical Co. (Osaka, Japan) and Sigma Chemical (St. Louis, MO), respectively. Other reagents were of analytical grade from Wako Pure Chemical Co. (Osaka). NO solution was prepared at room temperature by bubbling 10 mM Tris·HCl, pH 7.4, buffer solution with argon gas for 10 min and then for 30 min with NO gas thathad been passed through a KOH column (2 × 2.5 cm) to remove nitrogen dioxide. The pH did not change after treatment with the NO gas solution. Aliquots of the NO-saturated solution (1.9 mM) were used for the experiments. Interaction of microsomes with NO. Freshly prepared microsomes (4 mg of protein/ml) were suspended in argon-saturated phosphate-buffered saline (pH 7.4) and incubated with NOC7 for varying times at 37°C. After incubation, samples were immediately frozen under liquid nitrogen and subjected to ESR analysis. Aliquots of incubated samples were also used for the analyses described below. Determination of P450 contents in hepatic microsomes. Liver microsomes were prepared from male Wistar rats (220–250 g) (SLC Co., Shizuoka, Japan) as described previously (Funae and Imaoka, 1985). P450 contents in isolated microsomes were determined by measuring the intensity of low-spin heme (g = 2.26) using ESR and by absorption spectra of the reduced form vs.the reduced form of P450 CO complex (Omura and Sato, 1964a). The freshly prepared microsomes (400 μl of 4 mg of protein/ml) were put into ESR tubes (4-mm inner diameter), quickly frozen in liquid nitrogen and analyzed by ESR at 110°K using a JES-RE1X spectrometer (JEOL, Tokyo) with 100-kHz field modulation. ESR analysis was conducted with microwave power at 8 mW at a frequency of 9.108 GHz, 325 ± 100-mT field, 1-min sweep time, 0.63-mT modulation amplitude and 0.03-sec time constant. Determination of cytochrome b5 and NADPH-P450-cytochrome c reductase. Cytochromeb5 was measured spectrophotometrically (Omura and Sato, 1964b). Activity of cytochrome c reductase was also measured spectrophotometrically at 550 nm as described previously (Phillips and Langdon, 1962). Testosterone hydroxylation activity of microsomes. Testosterone hydroxylation activity of microsomes was measured at 37°C in 0.5 ml of 0.1 M potassium phosphate buffer, pH 7.4, containing 100 μg of microsomal protein, 0.2 μmol of NADPH and 0.5 μmol of testosterone. Hydroxylation of the substrates at positions 2α, 16α and 2β, 6β were catalyzed by microsomal 2C11 and 3A2, respectively. The reaction was started by adding NADPH. After incubation for 10 min at 37°C, the reaction was stopped by adding 2 ml of ethyl acetate. The reaction products, extracted by ethyl acetate, were analyzed by high-performance liquid chromatography as described previously (Funae and Imaoka, 1987; Imaoka et al., 1987a). To elucidate the possible involvement of substrate binding sites and cysteinyl residues in the modulation of P450 functions by NO, some experiments were performed with microsomal samples that had been pretreated with testosterone or diamide. To examine the effect of NO-induced oxidation of cysteinyl residues in microsomes, DTT was added to the reaction mixture 10 min after incubation with NOC7 (Ohlsteinet al, 1979). Testosterone hydroxylation activity of purified CYP2C11. CYP2C11 was purified from rat liver as described previously (Funae and Imaoka, 1985). The reaction mixture contained in a final volume of 0.5 ml, 0.1 M Tris·HCl, pH 7.4, 60 pmol of CYP2C11, 0.3 unit of NADPH-P450 reductase and 10 μg of phospholipid. The mixture was added to NO solution to give final concentrations of 20 and 40 μM. After incubation at 37°C for 8 min, testosterone hydroxylation activity was determined as described above. In some experiments, 20 μM DTT was added to the incubation mixture at 3 min after NO treatment to test the possible involvement of thiol oxidation by NO in the catalytic activity of CYP2C11. Western blot analysis of P450 isozymes. Specific antibodies against CYP2C11 and CYP3A2 were raised in rabbits, and IgG fractions were prepared as reported previously (Imaoka et al., 1987b). 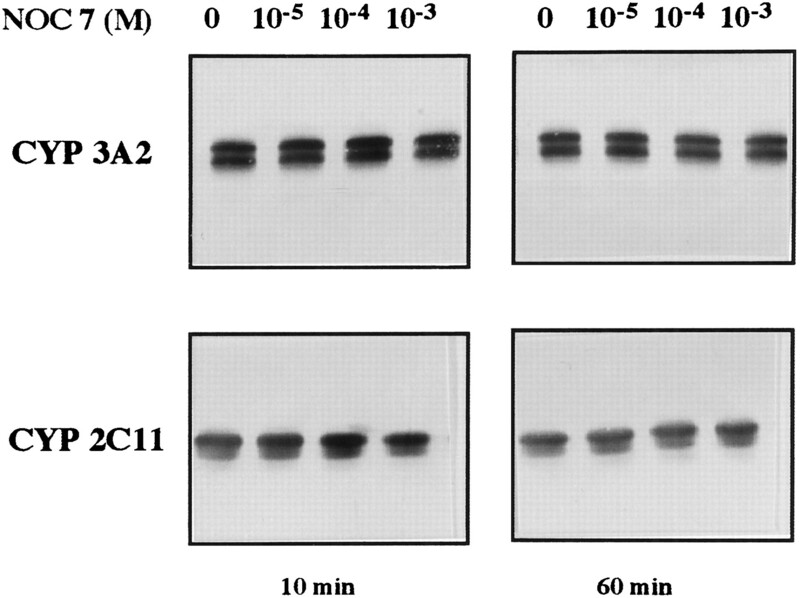 Microsomal samples (5 μg of protein) were subjected to sodium dodecyl sulfate (2%)-polyacrylamide gel (7.5%) and electrophoresed as described previously (Laemmli, 1970). The electrophoresed proteins were transferred electrophoretically to a nitrocellulose membrane and stained immunochemically. Levels of free thiols in microsomal samples were determined by using Ellman’s reagent (Ellman, 1959). Microsomes (100 μl of 4 mg of protein/ml) were mixed with 100 μl of 20 mM ice-cold Ellman’s reagent in 0.143 M phosphate buffer, pH 7.4, containing 6.3 mM EDTA. After incubation for 5 min, ethanol was added to the mixtures to give a final concentration of 90%. After centrifugation at 12,000 × g for 5 min, the reaction product in ethanol-soluble fractions was determined spectrophotometrically at 412 nm. Microsome samples treated with NO were subjected to ultrafiltration using 20,000 molecular weight cutoff filters (Sartrius AG, Göttingen, Germany). Free iron levels in the filtrates were determined by using an Fe-B test kit (Wako Pure Chemical). Total concentration of microsomal irons were measured after treating the samples with 0.5% Triton X-100. Interaction of microsomes with ONOO−. Freshly prepared microsomes (4 mg of protein/ml) were suspended in argon-saturated phosphate buffered-saline (pH 7.4) and incubated with ONOO− for 30 min at 37°C, and the samples were immediately tested for P450 content, testosterone hydroxylation activity and thiol levels. Western blot analysis of P450 isozymes were also carried out. Measurement of free radicals from microsomes. One hundred micrograms of microsomal protein were used for the detection of free radicals. Microsomes were incubated for 5 min at 37°C in 0.1 M potassium phosphate buffer, pH 7.5; 0.2 M DMPO was added; and the mixture was measured after 1 min at room temperature using ESR spectrometer. ESR conditions were magnetic field of 335.7 mT, microwave power of 8.0 mW, modulation frequency of 100 kHz, modulation amplitude of 0.1 mT, sweep width of 5.0 mT, sweep time of 10 mT/min, response time of 0.03 sec and receiver gain of ×500. To some experiments, 5 mM NADPH or 5 units/ml of SOD was added to the reaction mixture. Unless otherwise stated, data are presented as mean ± S.E.M. One-way analysis of variance was used where appropriate, and a value of P < .05 was considered significant. Effect of NO on P450 contents. When microsomes were incubated with 100 μM NOC7, which spontaneously and stoichiometrically releases NO within 5 min, P450 rapidly formed NO adducts at the heme moiety as determined by an ESR method. ESR spectra revealed a specific signal with a triplet hyperfine structure at a g value of 2.0 responsible for the nitrosyl-iron complex (fig.1). 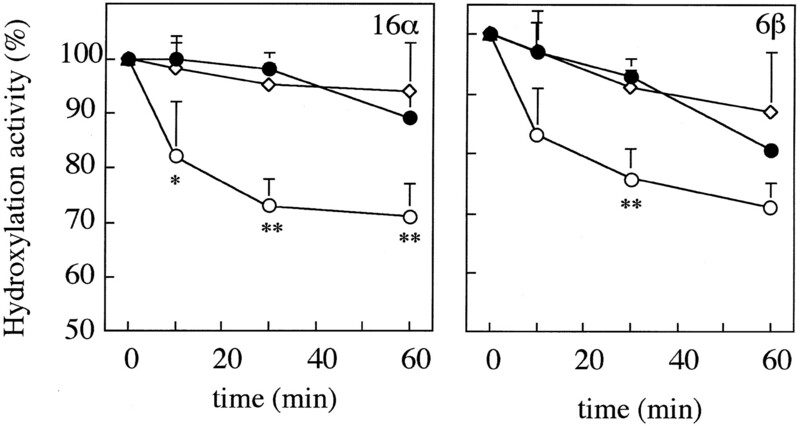 The signal intensity increased time-dependently, peaked at 30 min after incubation and then decreased thereafter, disappearing completely by 60 min of incubation (fig.2). In contrast, the microsomal levels of the low-spin ferric heme (g = 2.26) rapidly decreased during the initial 10 and 30 min by ≈60% and ≈90%, respectively. Thereafter, the signal responsible for the ferric form of P450 recovered time-dependently (70% at 60 min). Effect of NO on the formation of P450-NO complexes in the rat microsomes. Hepatic microsomes were incubated at 37°C with NOC7 (10 and 100 μM), which spontaneously and stoichiometrically releases NO within 5 min. After incubation at 10 min, 400 μl of the sample was quickly frozen with liquid nitrogen and set into an ESR spectrometer. ESR spectra revealed low-spin heme (g= 2.43, 2.26 and 1.91) and a specific signal with three-line hyperfine structure at g value of 2.0 responsible for the nitrosyl-iron complex. Time course of the formation and disappearance of low-spin heme (g = 2.26) and iron-nitrosyl complexes (g = 2.0). Hepatic microsomes were incubated with NOC7 and thereafter subjected to ESR samples as described in the legend of figure 1. The g value of 2.0 signal intensity increased time-dependently, peaked at 30 min after incubation and then decreased thereafter, disappearing completely by 60 min of incubation (A). Thereafter, the signal responsible for the ferric form of P450 recovered time-dependently. In contrast, the microsomal levels of the low-spin ferric P450 (g = 2.26) rapidly decreased during the initial 30 min (B). •, control; ○, NOC7 (100 μM). Data are mean ± S.E.M. (n = 3). ∗P < .05, ∗∗P < .01 compared with control. Analysis of differential spectra (reduced form vs. CO-reduced form) also revealed biphasic changes in the microsomal levels of P450 (fig. 3). Apparent levels of P420 in microsomes treated with NOC7 reversibly changed and showed a negative correlation with P450 levels (data not shown). Effect of NO on total contents of hepatic microsomal P450. Hepatic microsomes were incubated with NOC7 as described in the legend of figure 1. At indicated times, microsomes were reduced by Na2S2O4 and bubbled with CO gas. Analysis by differential spectra (reduced form/CO-reduced form) revealed the biphasic changes in the microsomal levels of P450. •, control; ⋄, NOC7 (10 μM); ○, NOC7 (100 μM). Data are mean ± S.E.M. (n = 3). ∗∗P < .01 compared with control. Levels of cytochrome b5 in NOC7-treated microsomes decreased from 0.37 ± 0.01 to 0.26 ± 0.02 nmol/mg of protein with a concomitant decrease in P450 levels. Microsomal levels of both cytochrome b5 and P450 returned to initial levels within 60 min. NADPH-dependent activity of cytochrome c reductase remained unchanged (0.262 ± 0.01 unit/mg of protein) during the experiments. Effect of NO on the structure of P450. To elucidate the mechanism for the decrease in the levels of reduced form P450, structural changes in microsomal P450 were studied by Western blot analysis of the sodium dodecyl sulfate-polyacrylamide gel electrophoresis using specific antibodies against CYP3A2 and 2C11. The antigenic activity and molecular size of P450 isozymes in the microsomal samples remained unchanged during the experiments (fig.4). Western blot analysis for P450 forms. Hepatic microsomes were incubated with NOC7 as described in the legend of figure 1. Microsomes (5 μg protein) were electrophoresed 7.5% polyacrylamide gels and transferred electrophoretically onto a nitrocellulose membrane. The nitrocellulose was stained immunochemically. Antibodies of P450 isozymes were used for anti-CYP2C11 and anti-CYP3A2 antibodies. These isozymes are major forms in hepatic microsomes of male rats. Effect of NO on testosterone hydroxylation activity of P450. Effect of NO on the catalytic activity of P450 was determined by using testosterone as a substrate because hydroxylation of steroid hormones is one of the major functions of P450. 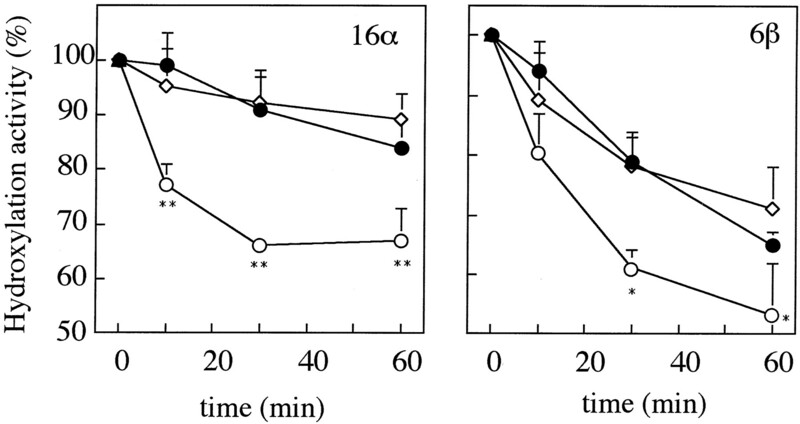 On incubation of liver microsomes at 37°C under atmospheric conditions, the catalytic activity of 2C11 and 3A2 isozymes spontaneously decreased. When incubated with 100 μM NOC7, the hydroxylation activity of the membranes for 2α-, 16α-, 2β- and 6β-OH testosterone rapidly decreased by 23%, 23%, 11% and 20%, respectively, during the initial 10 min and slowly disappeared (fig.5). The inhibitory effect depended on the concentration of NO; the decrease in the catalytic activity was enhanced at NO concentrations of >10 μM. The presence of 1 mM (final concentration) of substrate testosterone did not affect the inhibitory effect of NO (fig. 6). 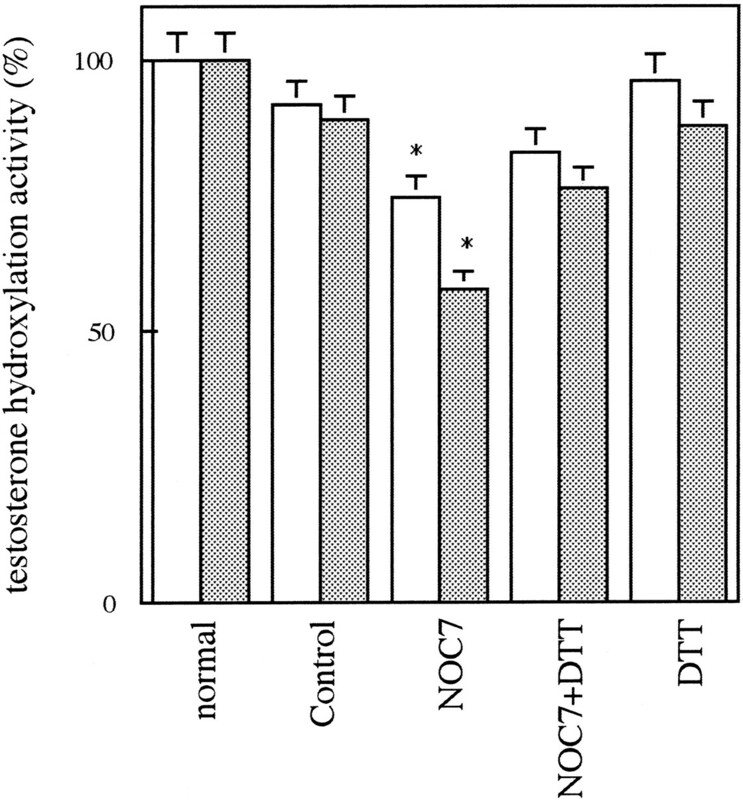 Changes in testosterone hydroxylation activity by NO donor. Hepatic microsomes were incubated with NOC7 as described in the legend of figure 1. The microsomal testosterone hydroxylase activity was measured in the incubation mixture containing 100 μg of microsomal protein, 0.2 μmol of NADPH and 0.5 μmol of testosterone in 0.5 ml of 0.1 M of potassium phosphate buffer, pH 7.4. Testosterone metabolites were extracted with ethyl acetate and analyzed by high-performance liquid chromatography. •, control; ⋄, NOC7 (10 μM); ○, NOC7 (100 μM). Data are mean ± S.E.M. (n = 3). ∗P < .05, ∗∗P < .01 compared with control. Effect of substrate pretreatment on the inhibition of testosterone hydroxylation activity by NO donor. Hepatic microsomes were incubated with NOC7 in the presence of 0.5 μmol of testosterone in 0.5 ml of 0.1 M of potassium phosphate buffer, pH 7.4. After the incubation, testosterone hydroxylation activity was measured as described in the legend of figure 5. •, control; ⋄, NOC7 (10 μM); ○, NOC7 (100 μM). Data are mean ± S.E.M. (n = 3). ∗P < .05, ∗∗P < .01 compared with control. Effect of NO on microsomal thiol levels and iron status. Free SH group is one of the important targets for NO. 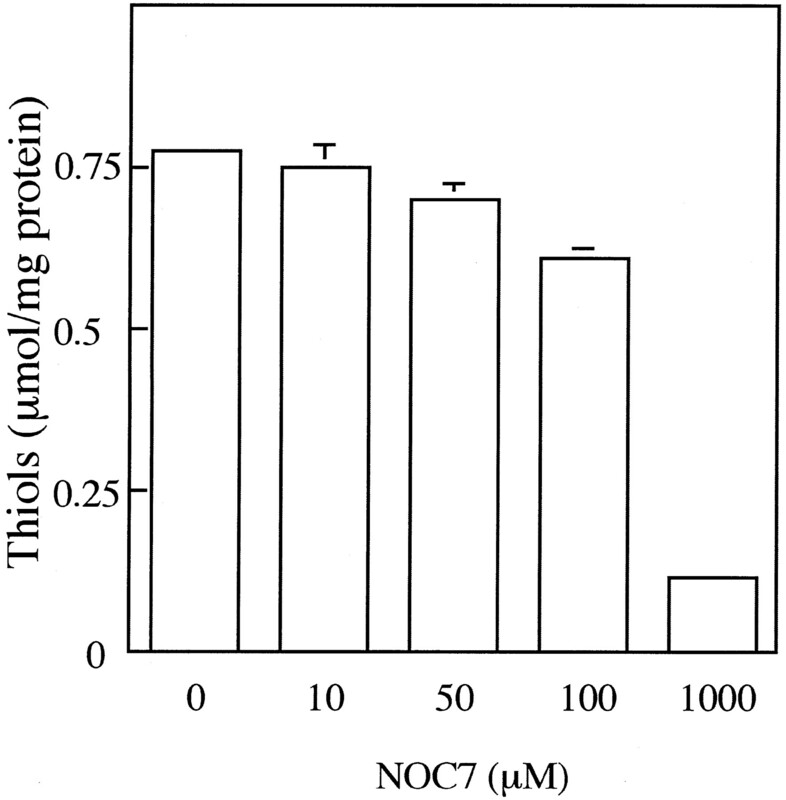 Incubation of microsomes with NOC7, an NO donor, decreased their levels of free thiol group in a concentration-dependent manner (fig.7). At NOC7 concentrations of 100 μM and 1 mM, microsomal SH levels decreased by ≈22% and ≈85%, respectively. Effect of NO on thiol levels of hepatic microsomes. Hepatic microsomes were incubated with NOC7 as described in the legend of figure 1. Total levels of thiols were determined by Ellman’s reagent at 60 min after the incubation. Microsomes (100 μl of 4 mg of protein/ml) were mixed with 100 μl of ice-cold Ellman’s reagent (20 mM). Ethanol was added to the reaction mixture to give a final concentration of 90%. After centrifugation at 12,000 ×g for 5 min, the reaction product of Ellman’s reagent (total thiols) in the ethanol-soluble fraction was determined spectrophotometrically at 412 nm. Data are mean ± S.E.M. (n = 3). ∗P < .05, ∗∗P < .01 compared with control. The level of iron associated with microsomes was 0.13 μg/mg of protein. 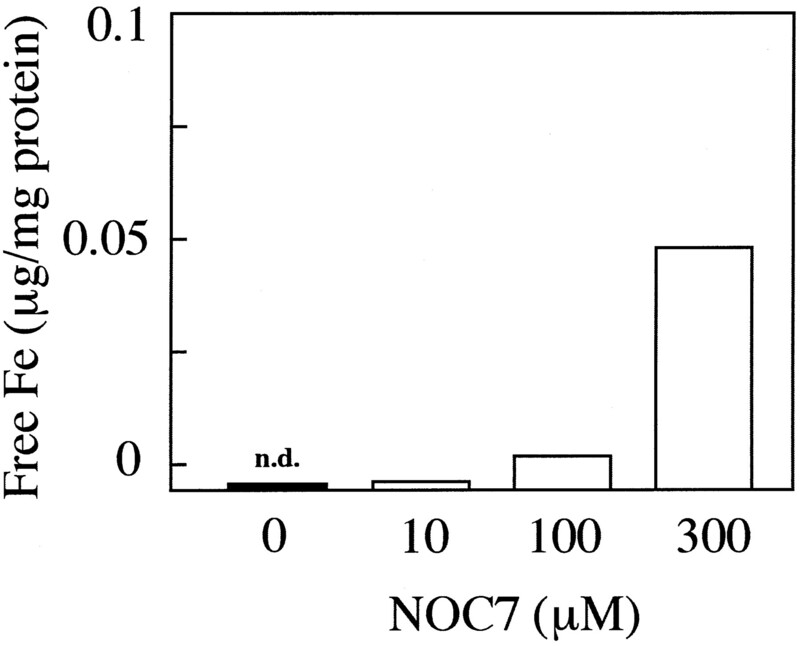 Incubation of microsomes with NOC7 released the membrane-associated iron only slightly, at concentrations of <100 μM. However, at a higher dose of NOC7 (300 μM), significant fractions of membrane-bound iron were released (fig.8). Effect of NO on iron liberation by microsomes. Hepatic microsomes were incubated with NOC7 (0, 10, 100 and 300 μM). After the reaction, microsomal samples treated with NO were subjected to ultrafiltration using 20,000 molecular weight cutoff filters. Free iron levels in the filtrates were determined by using an Fe-B test kit. Total iron levels of microsomes (0.13 μg/ml protein) were measured after treating the samples with 0.5% Triton X-100. nd indicates not detectable. Effect of thiol oxidation on testosterone hydroxylation activity. Diamide selectively oxidizes free SH groups. This compound decreased free thiol levels in microsomes dose-dependently (fig. 9), and this correlated well with the decrease in the hydroxylation activity of the microsomes. When NOC7-treated microsomes were incubated with DTT, the hydroxylation activity recovered fully to that of intact microsomes (fig.10). Effect of thiol oxidation on testosterone hydroxylation activity. Microsomes were incubated with various doses of diamide at 37°C for 30 min to modify thiols. After incubation, testosterone hydroxylation activity was measured as described in the legend of figure 5. □, 6β-OH; ⋄, 16α-OH. Data are mean ± S.E.M. (n = 3). r = .979 and .949 for 6β- and 16α-OH, respectively. Effect of thiol reduction after NOC7 incubation on testosterone hydroxylation activity. Hepatic microsomes were incubated with NOC7 (100 μM) at 37°C for 30 min. DTT (10 mM) was added to the microsomes at 10 min after NOC7 incubation. After the incubation, testosterone hydroxylation activity was measured as described in the legend to figure 5. □, 6β-OH for 3A2; ▩, 16α-OH for 2C11. Data are mean ± S.E.M. (n = 3). ∗P < .05, compared with control. Purified CYP2C11 showed 4.54 ± 0.25 and 6.27 ± 0.12 nmol/min/nmol of 2α- and 16α-hydroxylation activities, respectively. The purified P450 is fairly unstable and degraded during the incubation. When exposed to NO, the hydroxylation activity of the enzyme decreased dose-dependently by a mechanism that was fully recovered by DTT (fig. 11). Effect of thiol reduction on testosterone hydroxylation activity in purified CYP2C11 after NOC7 incubation. The reaction mixture contained in a final volume of 0.5 ml of 0.1 M Tris·HCl, pH 7.4, CYP 2C11 (60 pmol), NADPH-P450 reductase (0.3 unit) and phospholipid (10 μg). The mixture was added to give a final NO solution (20 and 40 μM) in 0.1 M Tris·HCl, pH 7.4, and incubated at 37°C for 8 min. Then, DTT (10 nmol) was added to the reaction mixture and then incubated for an additional 3 min. After the incubation, testosterone hydroxylation activity was measured as described in the legend to figure 5. Purified CYP2C11 showed 4.54 ± 0.25 and 6.27 ± 0.12 nmol/min/nmol of 2α- and 16α-hydroxylation activities, respectively. These were taken as 100% activity. □, control; ▩, +DTT. Data are mean ± S.E.M. (n = 3). †P < .05, compared with normal (without NO solution). ∗P < .05, ∗∗P < .01, compared with control. Effect of ONOO− on P450 structure and levels, thiol levels and testosterone hydroxylation activity. ONOO− (≈0.6 mM) did not affect P450 levels or structural changes in microsomal P450 analyzed by Western blotting for CYP3A2 and CYP2C11. 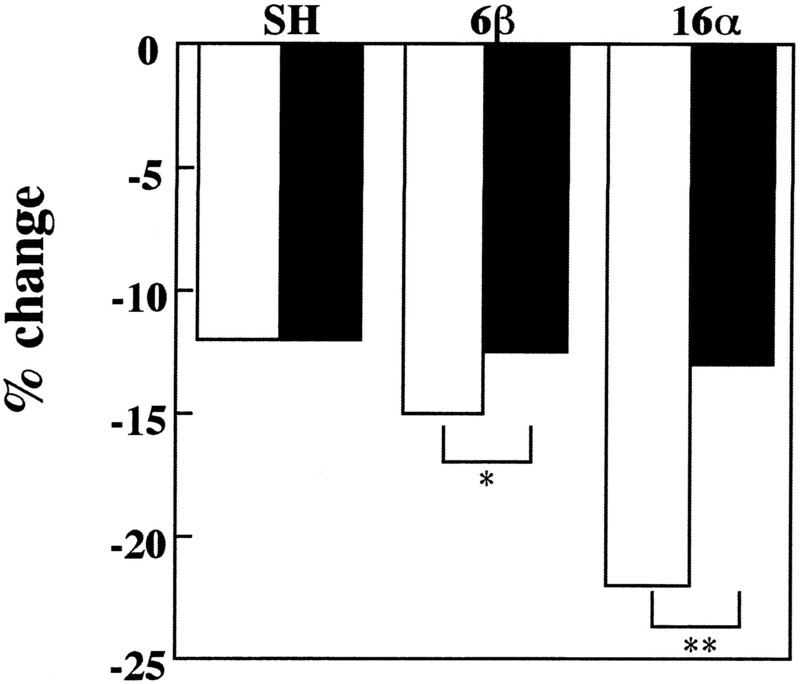 Microsomal levels of free thiols and testosterone hydroxylation activity decreased concentration-dependently (fig.12). Both 16α- and 6β-hydroxylation activities were decreased by ONOO− in the same manner. 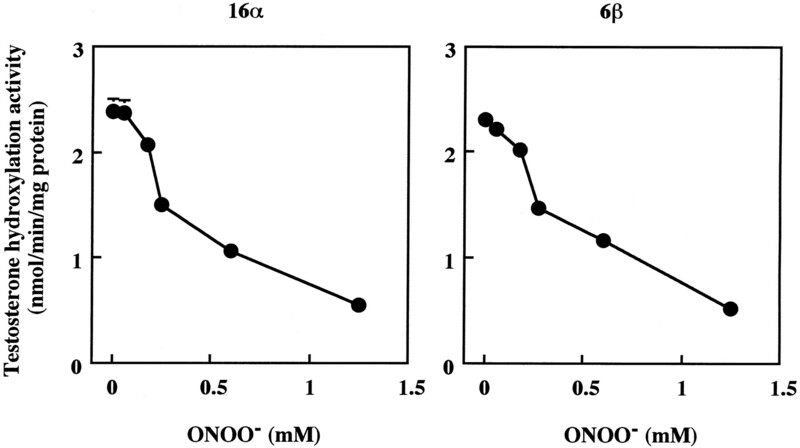 NO or ONOO− decreased microsomal thiol levels to the same degree, but NO-induced inhibition of testosterone hydroxylation activity was greater than that of ONOO− (fig. 13). Changes in testosterone hydroxylation activity by ONOO−. Hepatic microsomes were incubated with ONOO− for 30 min at 37°C. The microsomal testosterone hydroxylase activity was measured as described in the legend to figure5. Data are mean ± S.E.M. (n = 3). Effects of NO and ONOO− on free thiols and testosterone hydroxylation activity. Each 200 μM concentration of NO or ONOO− was incubated as described in Materials and Methods. After incubation, microsomal thiol levels and testosterone activity were measured. □, NO; ▪, ONOO−. Data are mean ± S.E.M. (n = 3). ∗P < .05, ∗∗P < .01. In all these experiments, the decomposition products of NOC7 or NOx (nitrite or nitrate) did not affect the results (data not shown). The present work demonstrates that NO can interact with P450 in two ways: NO reversibly binds to the heme moiety of P450, forming iron-nitrosyl complexes, and it irreversibly inactivates P450via the thiol modification pathway. ESR analysis revealed that, on incubation with either NO or an NO donor, the ferric form of P450 (g = 2.26) decreased with concomitant increase in the five-coordinated ferrous nitrosyl form (g = 2.0), similar to that of the inactive form, P420 (O’Keefe et al., 1978). When incubated with NO in the presence of NADPH, NO-dependent decrease in the ferric form of P450 in microsomes was inhibited with a concomitant increase in the level of ferrous-NO complex (data not shown). These observations suggested that both ferrous (ESR-detectable) and ferric forms (ESR-silent) of NO-P450 complexes were generated in microsomes. This reduction mechanism of ferric to ferrous forms of P450 is still unclear. However, in this study, microsomes spontaneously generated hydroxyl radicals as detected by the spin-trapping method (fig. 14). These signals were increased by the addition of NADPH but were abolished by superoxide dismutase, suggesting that these signals were derived from superoxide. These observations suggest that one possible mechanism is the reduction by superoxide or some other unknown reductants in microsomes (fig. 15). Free radical generation of microsomes. One hundred micrograms of microsomal protein were used for detection of free radicals. Microsomes were incubated 5 min at 37°C in 0.1 M potassium phosphate buffer pH 7.5. After incubation, 0.2 M DMPO were added to microsomes and measured after 1 min at room temperature using ESR spectrometry. ESR conditions were magnetic field of 335.7 mT, microwave power of 8.0 mW, modulation frequency of 100 kHz, modulation amplitude of 0.1 mT, sweep width of 5.0 mT, sweep time of 10 mT/min, response time of 0.03 sec and receiver gain of ×500. To some experiments, 5 mM NADPH or 5 units/ml superoxide dismutase was added to the reaction mixture. Hydroxyl radical generation was observed in microsomes. MnO was used as internal standard. Possible mechanisms of P450 inactivation by NO. Ferric form of P450 may be reduced by superoxide or other unknown reductants in microsomes. In either case, NO reacts with the heme iron. On liberation of NO, the activity of the ferrous form of P450 is irreversibly inhibited. An ESR-detectable but inactive ferric form may also be formed. 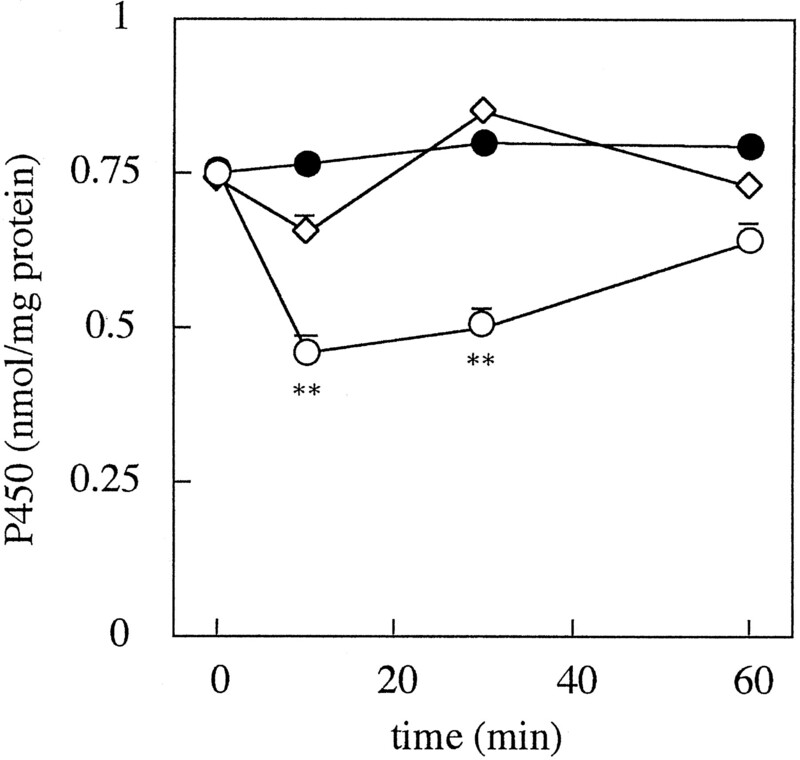 The decrease in testosterone hydroxylation activity seems to correlate with the decrease in P450 contents during the initial 30 min of incubation. Although ≈90% of P450 was apparently recovered spectrophotometrically 60 min after incubation with NOC7, its catalytic function remained inactivated. The inhibitory effect of NO was not affected by the presence of testosterone. Hence, the critical site(s) for modification by NO might be localized at site(s) other than the heme moiety and substrate-binding sites of P450. The present work also demonstrates that NO decreased the free thiol levels in microsomes in a concentration-dependent manner. However, microsomal electron transport system was not affected by NO because NADPH-cytochrome c reductase activity remained unchanged during the experiments. In contrast, oxidation of free thiols in microsomes and purified CYP2C11 by either NO or diamide significantly decreased the testosterone hydroxylation activity of P450 by a mechanism that was recovered by DTT. Thus, the free cysteinyl residue(s) in P450 might play a role in the maintenance of its catalytic activity. P450-catalyzed O-dealkylation of benzyloxyresorufin was inhibited by NO by some mechanism that was presumably suppressed by the formation of albumin-S-NO (Wink et al., 1993). Serum albumin has a free sulfhydryl group (Cys34) that might have reacted with NO to from albumin-S-NO, thus liberating the sulfhydryl group of P450 and recovering its catalytic activity. A peak of NO-P450 complex was slower than that of NOC7-released NO. Because NO and its intermediate metabolites rapidly form nitrosothiols, a slow releaser of NO, in the presence of oxygen, the delay of the peak may be due to the nitrosothiols slowly releasing NO, which secondarily reacted with heme to form an NO-P450 complex for a fairly long time. NO dose-dependently inhibited the hydroxylation activity of P450, and the inhibitory effect was more pronounced with CYP2C11 (≈1.5-fold) than with CYP3A2. Although CYP2C11 and CYP3A2 have nine and six cysteinyl residues, respectively (Yoshioka et al., 1987;Miyata et al., 1994), critical cysteinyl residues required for their activity remain unclear. In consideration of these results, possible mechanisms of P450 inactivation are shown in figure 15. Ferric (No. 1) and ferrous (No. 2) forms of P450 coexist in microsomes. Ferrous forms of P450 (No. 2) are partially produced by superoxide and unknown reductants-induced reduction of No. 1. NO reacts with both 1 and 2 to produce 3 and 4, respectively, and the NO-heme reaction is fairly rapid at nearly diffusion-limited rates (Cassoly and Gibson, 1975; Doyle et al., 1988). Although the ferric-NO form (No. 4) is relatively more stable than ferrous-NO (No. 3), the reduction process from 4 to 3 takes place in the presence of another NO and OH− (Hoshino et al., 1996). No. 3 releases its heme-bound NO in the presence of oxygen (No. 5) and results in the formation of nitrate and an ESR-detectable oxidized form (No. 6) (Yoshida et al., 1980). The NO-thiol (NO—S—) reaction is relatively slower (k= 6 × 106M−2·sec−1) (Goldstein and Czapski, 1996) than that of NO-heme. However, the rate at which NO is released from S-nitrosothiols differs among targets for NO. For example, S-nitrosothiol of low molecular proteins (cysteine, glutathione, and so on) has a shorter half-life than that of high molecular proteins (albumin, and so on), with the half-life of albumin-S-NO being >10 hr (Arnelle and Stamler, 1995). Thus, the half-life of P450-S-NO (P450 is a higher molecular protein) may be speculated to be fairly long, resulting in the irreversible inactive forms. Hence, No. 1 apparently transforms to No. 3 and is completely recovered as No. 6 for the ESR-detectable forms, but the reactivity is not recovered. Because inducible NO synthase is strongly induced in the liver of endotoxemic subjects, high concentrations of de novosynthesized NO might irreversibly inhibit the activity of P450. Reactive intermediates of NO and oxygen enhance the oxidation and nitrosation of various molecules (Nguyen et al., 1992; Winket al., 1991). In fact, tyrosine residues in various proteins are oxidized by nitrogen dioxide (k = 5 × 109M−1·sec−1) (Prutzet al., 1985). Thus, nitration of tyrosine residues might underlie the mechanism for the inhibition of their catalytic activity by NO. However, under the present experimental conditions, nitrotyrosine was not detectable in NO-treated microsomes as determined by Western blot analysis using anti-nitrotyrosine antibody (data not shown). Although the same concentration of ONOO−as NO decreased free thiol levels in microsomes, NO-induced inhibition of testosterone hydroxylation activity was stronger than that of ONOO−. These results suggest that the sites of thiol modification are different for NO and ONOO−. However, the reactivity of NO and free thiol is ≈1000-fold faster compared with ONOO−. Therefore, considering the diffusion rate, reactivity of ONOO− may not be much affected in vivo. Levels of P450-NO adducts increased in the liver of endotoxemic rats with concomitant decrease in P450 activity. The presence of endotoxemia and decrease in hepatic GSH levels and the enhancement of GSH turnover caused a condition of high oxidative stress. The occurence of oxidation of SH in endotoxemic liver may be due to some NO-dependent mechanism. The endogenous NO generation may negatively regulate steroidogenesis through interaction with P450. In view of the results of this study, the mechanism of P450 inactivation by NO and the importance of NO-P450 interaction in the pathogenesis of liver injury in endotoxemia should be further studied. The authors thank Dr. Ryusei Konaka and Dr. Tetsuhiko Yoshimura for their valuable suggestions. ↵1 This work was supported in part by grants-in-aid from the Ministry of Education, Science, and Culture and the Osaka City University Medical Research Foundation Fund for Medical Research and a grant for medical research from AOA Japan Co. Ltd. Medical Research Foundation. 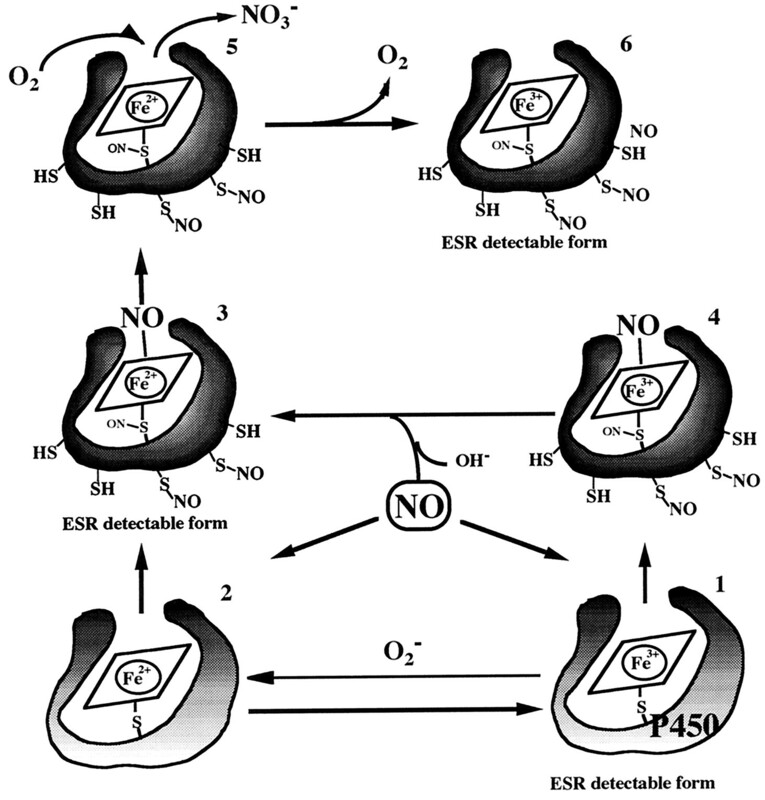 (1995) NO+, NO, and NO− donation by S-nitrosothiols: Implications fir regulation of physiological functions by S-nitrosylation and acceleration of disulfide formation. Arch. Biochem. Biophys. 318:279–285. (1975) Conformation, co-operativity and ligand binding in human hemoglobin. J. Mol. Biol. 91:301–313. (1988) Oxidation and reduction of hemoproteins by trioxodinitrate(II): The role of nitrosyl hydride and nitrite. J. Am. Chem. Soc. 110:593–599. (1959) Tissue sulfhydryl groups. Arch. Biochem. Biophys. 82:70–77. (1985) Simultaneous purification of multiple forms of rat liver microsomal cytochrome P-450 by high-performance liquid chromatography. Biochim. Biophys. Acta 842:119–132. (1987) Purification and characterization of liver microsomal cytochrome P-450 from untreated male rats. Biochim. Biophys. Acta 926:349–358. (1996) Mechanism of the nitrosation of thiols and amines by oxygenated NO solutions: The nature of nitrosating intermediates. J. Am. Chem. Soc. 118:3419–3425. (1993) EPR characterization of molecular targets for NO in mammalian cells and organelles. FASEB J. 7:1124–1134. (1996) Studies on the reaction mechanism for reductive nitrosylation of ferrihemoproteins in buffer solutions. J. Am. Chem. Soc. 118:5702–5707. (1987a) Purification and characterization of six cytochromes P-450 from hepatic microsomes of immature female rats. J. Biochem. Tokyo 102:843–851. (1987b) Purification and characterization of two constitutive cytochromes P-450 (F-1 and F-2) from adult female rats: Identification of P-450F-1 as the phenobarbital-inducible cytochrome P-450 in male rat liver. Biochim. Biophys. Acta 916:358–367. (1995) Nitric oxide and intracellular heme. in Nitric Oxide: Biochemistry, Molecular Biology and Therapeutic Implications, eds Ignarro L., Murad F. (Academic Press, San Diego), pp 277–291. (1992) Nitric oxide takes centre-stage with newly defined roles. Trends Pharmacol Sci. 13:1–6. (1994) Structure of a gene and cDNA of a major constitutive form of testosterone 6 beta-hydroxylase (P450/6 beta A) encoding CYP3A2: Comparison of the cDNA with P450PCN2. Arch. Biochem. Biophys. 314:351–359. (1992) Nitric oxide as a secretory product of mammalian cells. FASEB J. 6:3051–3064. (1992) DNA damage and mutation in human cells exposed to nitric oxide in vitro. Proc. Natl. Acad. Sci. U.S.A. 89:3030–3034. (1979) Methemoglobin blockade of coronary arterial soluble guanylate cyclase activation by nitroso compounds and its reversal with dithiothreitol. FEBS Lett. 102:316–320. (1978) An infrared spectroscopic study of carbon monoxide bonding to ferrous cytochrome P-450. Biochemistry 17:5845–5852. (1964a) The carbon monoxide-binding pigment of liver microsomes. I. Evidence for its hemoprotein nature. J. Biol. Chem. 239:2370–2378. (1964b) The carbon monoxide-binding pigment of liver microsomes. II. Solubilization, purification, and properties. J. Biol. Chem. 239:2379–2385. (1962) Hepatic triphosphopyridine nucleotide-cytochrome c reductase: Isolation, characterization, and kinetic studies. J. Biol. Chem. 237:2652–2660. (1985) Reactions of nitrogen dioxide in aqueous model systems: Oxidation of tyrosine units in peptides and proteins. Arch. Biochem. Biophys. 243:125–134. (1996) Dynamic aspects and role of nitric oxide in endotoxin-induced liver injury. 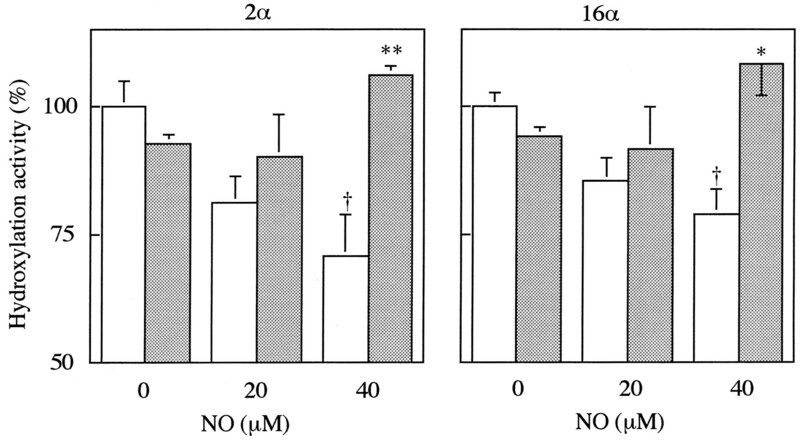 in The Biology of Nitric Oxide: Part 5, eds Moncada S., Stamler J., Gross S., Higgs E. A. (Portland Press, London), p 278. (1991) DNA deaminating ability and genotoxicity of nitric oxide and its progenitors. Science 254:1001–1003. (1993) Inhibition of cytochrome P450 by nitric oxide and a nitric oxide-releasing agent. Arch. Biochem. Biophys. 300:115–123. (1980) Metabolic fate of nitric oxide. Int. Arch. Occup. Environ. Health 46:71–77. (1987) Structural analysis and specific expression of microsomal cytochrome P-450 (M-1) mRNA in male rat livers. J. Biol. Chem. 262:1706–1711.